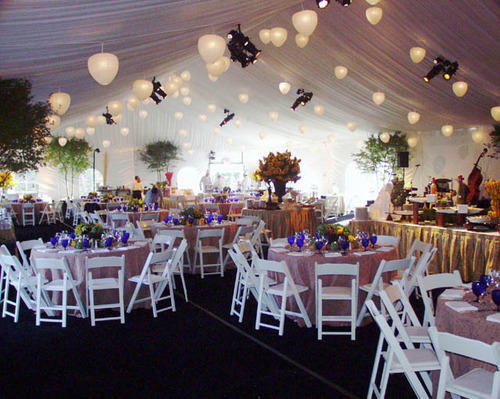 Party tents are freestanding or attached to a garden wall, roofed, and open on all sides; they provide shade, shelter, ornamental features in a landscape, and a place to rest. Some tents in public parks are large enough to serve as bandstands or rain shelters.In order to meet the changing demands of our esteemed clients, we are offering Party tents. We offer these Party tents to the customers in different patterns, sizes and sizes in order to meet their different needs. Before the end delivery, all our offered Party tents are stringently checked on varied parameters by the quality analyzers to ensure their defect-free nature. “Suraj Corporation” is a well-known organization established in 1970, at mumbai (Maharashtra, India) and engaged in manufacturing, trading exporting and supplying high quality assortment of promotional folding umbrellas, promotional golf umbrellas, promotional stick umbrellas, customized promotional umbrellas, garden umbrellas and single fold long umbrella. These umbrellas are precisely designed and manufactured using optimum quality raw material under the supervision of our quality controllers in our state-of-the-art manufacturing unit. We use advanced technology, latest machinery & equipment to manufacture these umbrellas in accordance with the international quality standards. Also, the offered umbrellas are widely acknowledged for features such as flawless finish, elegant design, durability, tear resistance and accurate dimension. Apart from this, the offered umbrellas are available in various sizes, designs and colors at affordable prices. In a decade’s time suraj corporation won the trust of people as a company which was dedicated to quality, commitment & professionalism. Suraj corporation celebrates its 43rd year of successful business accomplishments and relations with its customers. Suraj corporation has an authentic registered trademark named as olympic brand and is a renowned stockist of various internationational and regional umbrellas manufacturers like happy umbrella, hello umbrella, susiono umbrella, arnaldo bassinio, motherland umbrella. Suraj corporation has a wide range of corporate supply of umbrellas to companies like wipro, bonnanza stock broking, flamingo, ebrahim currim & sons (stag).